Make your own gummies out of seaweed! 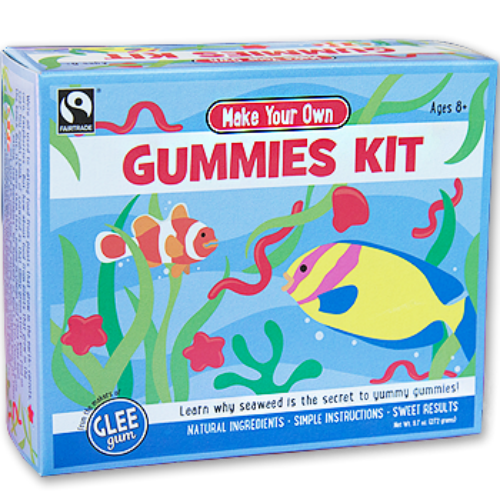 Everything you need is included to make your own gummi bears, gummi worms, gummi fish or any other shape. Make gummies on the stove or with a microwave. A perfect gift for kids ages 8 and up. Ingredients: Sugar, corn syrup solids, seaweed (not for consumption), vegetable gums (agar, carrageenan and tara gum powder), citric acid, beet color, and natural cherry flavor. Includes molding starch for molding purposes only. Includes molding starch for molding purposes only. Contains corn ingredients. Some ingredients processed in facilities that also process milk, egg, tree nuts, wheat, peanuts, and soybeans. Sugar traded in compliance with Fairtrade Standards, total 38%.